We need to consider the solutions to concentrated poverty, if having more than 20 percent of a neighborhood comprised of poor people represents a problem we as a society can ill afford. Elsewhere on the site, in the concentration of poverty page and one on community poverty, we tell you why and how research shows this to be a social issue we need to remedy. Lower income people can identify the need to move to a somewhat more prosperous and economically diverse area, and then formulate and execute a plan to do so. Government or strong non-profit organizations can sponsor and facilitate smart, targeted programs to help people raise incomes. In the longer run, of course, educational achievement for all children and adults is critical in breaking cycles of poverty that span generations of the same family. Anecdotal evidence (word of mouth) suggests that households opt for the first solution to the extent that small increases in income give housing options in better neighborhoods, destination neighborhoods are known and feel comfortable, and the household is functional. Functional households may be the most complex element of the equation. Our umbrella term covers traits such as mental health, including the absence of depression and the presence of a sense of hope for a better life. Functionality also may mean executive function and impulse control sufficient to form and carry out a plan for the multi-stage activity of moving. Being functional in this context also means having some ability to learn and process new information about neighborhoods and their characteristics, as well as rents or home prices. Lastly, the household must be able to overcome family factors, such as extended family opposing the move, legal factors such as illegal immigration status or other reasons for fear of law enforcement, or limitations on where a household can move imposed by a divorce decree. All in all, we think that depending on individual household initiative will not produce large-scale change. So we pivot to considering government or non-profit sponsored programs. Since this website is focused more on neighborhood and community activism than on individual and family characteristics, we turn now to programs that could and should be sponsored by government with either support or leadership from the nonprofit sector as community dynamics warrant. This story may start in the U.S. when a court case in Chicago, known as the Gautreaux case, was settled by ordering that public housing residents be given the opportunity to move to areas with less concentrated disadvantage. This pretty much accidentally set up a good social experiment when some public housing residents used housing vouchers in the early 1990s to move to better neighborhoods, while others remained in the old neighborhood. Enterprising researchers studied the differences between the two types of households. Results showed markedly better outcomes for those who were moved to the more mixed-income neighborhoods. Children performed better in school, and so on through the list of socially desirable outcomes. Of all possible solutions to concentrated poverty, this one appeared promising. 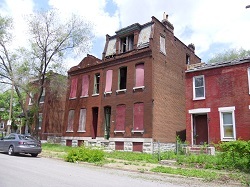 Consequently HUD (the U.S. Department of Housing and Urban Development) decided to do a five-city pilot program called Moving to Opportunity, in which some households were deliberately allowed to use their vouchers only in an overwhelmingly moderate-income neighborhood. This time the results were mixed. Chicago and Baltimore saw decidedly better results for families moved to the higher-income areas, whereas there was little effect in New York, Boston, and Los Angeles. Even the researchers don't know all the reasons for this inter-city difference. We decided to look into the Baltimore experience further to analyze why its Moving to Opportunity program would be considered a success. After reading available material and talking with some folks, we think their program design probably explains the success. This educated guesswork on our part wouldn't pass muster in academia, but for practitioners who must soldier on while research sorts out the factors, we think that decision makers should proceed to imitate some aspects of the Baltimore program as they seek solutions to concentrated poverty. Applicants who pass background checks are routed into a housing counseling program to help them present themselves as desirable tenants. Program participants attend financial education classes and receive financial counseling. Households in the program take van tours to become familiar with employers, schools, and amenities in higher opportunity neighborhoods. Next program participants save for a security deposit and work with a counselor to find housing that meets their needs. Definitions of a higher opportunity neighborhood are rather stringent. In Baltimore program participants receive a federal Housing Choice Voucher targeted to areas where less than 10% of the population falls under the poverty line, fewer than 30% of residents are minorities, and where public housing or government housing assistance complexes comprise less than 5% of all housing units. Two or more years of post-move counseling are provided to help households adjust to living in their new neighborhoods, and even second move counseling is offered free. The non-profit partner (the community action agency) markets the program to landlords. Employment-related transportation assistance is provided, as program managers regarded Baltimore as having a weak public transportation system. Key also may be the involvement of private groups, including civil rights groups and social service agencies, and a housing authority contractor that is committed to the success of the program. In addition to running explicit Moving to Opportunity types of programs, cities and neighbors could make it easier for lower-income households to afford housing in better neighborhoods through some other measures that would save families money. First, transit efficiency and effectiveness are important to successful relocation. Adequate frequency of service and reasonable cost, routing that reflects resident needs, and even good flexible transportation options (called demand-responsive) all support the mixed-income housing outcome that is healthy for many households. We're saying all of this because quality transit is an important means of stretching a household budget. In addition, even in the most distressed cities, transit usually is available in the inner core and often becomes less and less tenable as one moves away from the downtown area. People living in poverty often have depended on public transit to a degree that suburbanites don't understand. Therefore, we think that better transit options in suburbs can contribute to solutions to concentrated poverty. Another strand of thought that may be useful in finding solutions to concentrated poverty would include embrace of transit-oriented development. Second, energy efficiency must be a consideration. In all but the most moderate climates, energy for heating and cooling is a major expense. By requiring cost-effective energy efficiency innovations in new construction, over time a jurisdiction can bring about a lower energy cost structure. Obviously there are some serious limitations to what a "built out" area can do. Requiring retrofits of existing housing is fraught with so many complicated variations that it is not a practical policy in most situations. However, both the still developing and the built-out communities can encourage energy conservation through a variety of educational and campaign-building tactics. Third, governments should make every effort to reduce the regulatory burden on housing. We think that on average, jurisdictions need more regulation, particularly the sensitive fine-tuned kind. But it is just as true that some jurisdictions either have gone overboard on too much of a good thing. Perhaps they have not updated their thinking and laws to reflect current construction practices, materials, and technology, as well as up-to-date land use planning principles. Maybe they are requiring a costly practice that really is not necessary for building an inclusive community. Fourth, we suggest thinking about a suburban retrofit. Creating town centers, cutting through the ends of cul-de-sacs with walking paths or new streets, adding sidewalks, and redeveloping strip malls into more vibrant mixed-use projects all can be helpful in providing solutions to concentrated poverty. These seemingly unrelated topics all can help new suburbanites minimize their transportation needs and costs through adding walking to the suburban transportation mix, as well as through adding shopping options within walking distance. Better active transportation (walking plus bicycling) choices mean better opportunities for allowing lower-income familiar to blend into the fabric of a suburban or lower density urban community. After many experiments with alleviating poverty, the U.S. has yet to find any magical answer, and many European countries are struggling with the costs of income support and the social safety net they have invented. As Thomas Edsall's op-ed in the New York Times points out, young children who are regularly exposed to violence and other harsher impacts of poverty may develop different brain architecture. Adults with chronic unemployment or underemployment issues do not suddenly become money-making machines when they move to the suburbs. Children who start school in poor educational systems do not quickly overcome those educational deficits. These are only a few of the factors that lead to poverty in the first place, and in particular poverty that spreads across several generations. Yet all of these factors can be addressed through very high quality educational systems that deal with the entire environment that impacts a child, alongside academic achievement as narrowly defined. If the highest quality schools were aimed at neighborhoods now characterized by concentrated poverty, given enough time, many of these concentrations would evolve into economically integrated communities. In short, one of the most promising solutions to concentrated poverty is found in the Moving to Opportunity experiments and also a dispersal program in Montgomery County, Maryland, that showed much improved math test scores several years later among kids who were moved to moderate-income areas. However, a well-run program that includes extensive supportive services would be imperative. Still another of the possible solutions to concentrated poverty, namely enticing higher-income people to move into these more poverty-stricken neighborhoods, seems even more difficult to achieve. We certainly encourage steadfast work on improving the appeal of lower-income neighborhoods, both for the benefit of those living there and for the possible benefit of future residents of a slightly higher income. In most but not all areas of concentrated poverty, there is enough vacancy that we believe that gentrification and the resulting displacement of poor people can be avoided. There are many resources on this website for improving neighborhood quality, and you may want to check out the sitemap as you plan your strategies. A neighborhood association and a neighborhood plan can help immensely. While there is much more work to do at the policy level, let's dedicate ourselves to preventing children from growing up in areas dominated by high rates of poverty, unemployment, welfare dependence, single-parent households, and racial segregation. Any one of these challenges certainly can be overcome on the individual household level, but on the other hand, sound neighborhoods support the individual family. A "moving to opportunity" approach, while necessary, is not sufficient. We will need to work on the root causes of poverty and neighborhood decline as well. Remember that this page is designed to work in tandem with the related but different pages on community poverty and concentration of poverty, so please read those as well. The community poverty page talks about why individual households may be experiencing poverty, the role of racial and ethnic segregation, and types of community support needed for individuals in poverty. The concentration of poverty page talks about making a physical plan and a social plan for easing poverty, as well as the importance of regional responsibility. Below are some other pages that might prove helpful as you try to understand potential remedies for economic segregation.